Morocco, 1984. High in the Atlas Mountains, Hanane’s love for Irishman Gus is forbidden. Forced to flee her home with the man she loves, Hanane is certain she’s running towards her destiny. But she has made a decision that will haunt her family for years to come. London, 2009. When Addy discovers a mysterious letter in her late father’s belongings, she journeys to Morocco in search of answers. But instead, she finds secrets – and is quickly pulled into a world that she doesn’t understand. 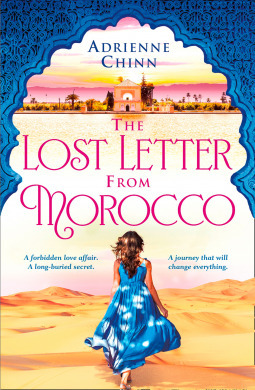 Reading the blurb I thought The Lost Letter from Morocco by Adrienne Chinn sounded an interesting book set in a country I know very little about. The setting in Morocco is well described, although in places it comes across as more of a travel and cultural guide than a novel and I liked that much more than the rest of the book. So, I’m sad to say that this book did not live up to my expectations and it was a disappointment. Set in two time frames the narrative moves between Addy’s and Haldane’s stories. In 2009 Addy is recovering from cancer and conscious of how short life can be she has decided to sell her flat, leave Nigel, her cheating boyfriend, and her job in a photography shop to work on a travel book. Her father had recently died and in his belongings she finds an unfinished letter addressed to her from him, together with several photos of Morocco, including a photo of him with an arm around a young woman. On the back of the photo her father had written ‘Zitoune waterfalls, Morocco, August 1984 – with Hanane.‘ Haldane is clearly pregnant. Seeing her father’s photos of Morocco she decides that is the place to go to try to find out what had happened to Haldane and at the same time to work on her travel book. I was keen to find out what Addy would discover. However, what followed is a rambling and repetitive story about Addy and Omar, a tour guide, and their relationship. It was slowed down with too much detail and I began to lose interest and at several points I almost abandoned the book. Omar is a an annoying character, bossy and possessive with Addy, who for a 40 year old woman is incredibly naive, even given that she is recovering from cancer and from her broken relationship with Nigel. I was much more interested in Gus and Haldane’s story and was frustrated by having to wade through the details of Addy’s and Omar’s relationship as she discovered what had happened in 1984. The twist at the end made me even more disappointed that the story had not focused on Haldane’s story.